It is good to see the traffic watchdog being more visible but surely they are barking up the wrong tree if their efforts are aimed at only minor transgressors rather than those who are endangering others. Last week three traffic officers camped out on da Gama Road, Cape St Francis in site of the stop street. Now this must be a major accident hotspot for it attracts regular traffic department attention. Or is it that issuing fines for not wearing a seat belt or failing to come to a complete stop when turning left into da Gama Road is a rather profitable way to earn municipal income without raising a sweat? And of course there is a handy little shop where one can buy a cool drink if the hectic action gets too hot. Should turning left at this particular stop street be necessary? Surely a ‘Yield on Left Turn’ sign should be in place. It is not a four-way-stop and there is no possible likelihood or danger of a collision. There are areas where this is allowed and in fact the four-way-stop on Lyme-St Francis Drive-Peter Road has a yield on left turnout of Peter Road. Now this is a really busy intersection so surely if the traffic authorities can deem it safe to turn left here, surely the stop at Cape St Francis should be considered? Or is it too much of a cash cow? Maybe the Cape St Francis Civics Association need to have a chat to the powers that be. 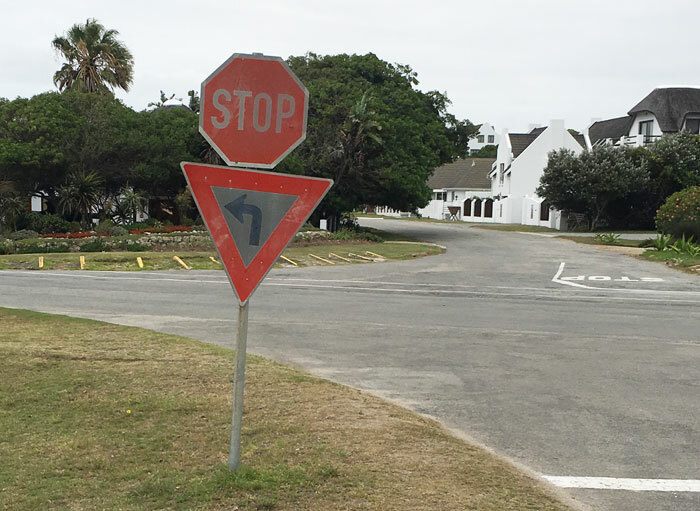 Intersection on St Francis Drive allows yield to left – why not the same from R330 into Da Gama Road, Cape St Francis?